SBR has partnered with the CoRE Initiative and the Environmental Alliance to host this early fall networking event. Throughout the year we want to give you the opportunity to visit places and meet people who are helping inspire and shape the region today and in the future. (That includes you!) We are starting this journey in the Old First Ward where Buffalo first moved goods and made products along the River. 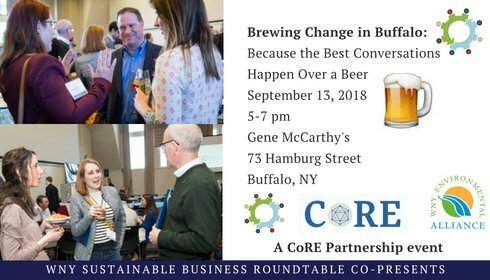 The CoRE Initiative is a Buffalo born and led research and education partnership co-led by the UB Materials Design & Innovation Department, Niagara Share and Clean Production Action with non-governmental, community outreach organizations and business organizations (including SBR) that bring together complementary expertise – in research, market analysis, policy formulation, and social innovation — to support the transition towards a safer materials economy and building blocks for the factory of the future. So let’s hang out in the beer garden, enjoy the day, and start talking.